Agip 'Servizio A' Service Sticker. 2.75". Agip Black & Clear Stickers. 6" Tall Pair. Agip Black & Silver Oblong Stickers. 3" or 6" Pair. Agip Black & Silver with Red Dot Oblong Stickers. 12" Pair. Agip Black & White Oblong Sticker. 16.5". Agip Chequered Background Stickers. 5" Pair. Agip Colour Oblong Stickers. 6" Pair. Agip Cut Vinyl Oblong Sticker. 8". Agip Earlier Style Joined Stickers. 7.5" Tall Pair. Agip Earlier Style Tall Sticker. 9". Agip Earlier Style Wavy Chequered Flags Large Sticker. 9.75". Agip Earlier Style Wavy Chequered Flags Stickers. 4" Pair. Agip Fuel Filler Sticker. 4". Agip Later Style Tall Sticker. 8" or 11". Agip Later Style Wavy Chequered Flags Stickers. 4" Pair. 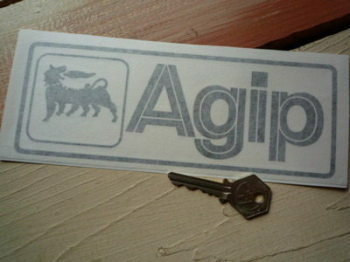 Agip Later Style Wide Sticker. 8". Agip Old Style Yellow Oblong Stickers. 7.75" Pair. Agip Yellow Oblong Stickers. 8" Pair. Eni Oblong Stickers. 4.25" Pair. Eni Yellow Stickers. Set of 4. 1".